iNDiViDUALS breaks unwritten rules during the Opening Night of Amsterdam Fashion Week! 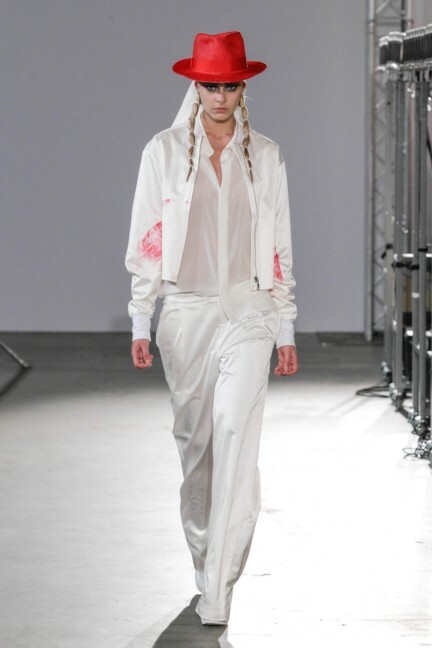 On Friday 12th July S/S14BY21iNDiViDUALS astonished the audience by having no catwalk. The brand created an intimate show at the Transformatorhuis for Dutch and international guests from the fashion industry. 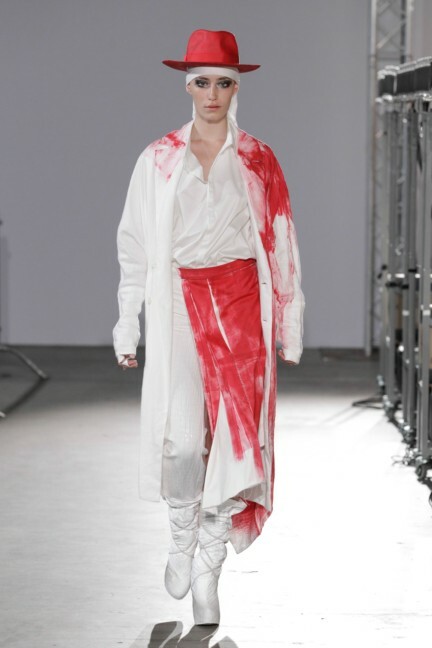 The striking feature of the collection was the use of red paint on white and unbleached garments, from small accents to completely red styles. Emotion and experience were central to the performance, as sound was used in an innovative way by a collaboration with MediaLAB Amsterdam. “Our lives are tense, explosive and demanding. We are free to go, but the pressure that we feel holds us back. We are looking for the individual freedom to explore what we want”. 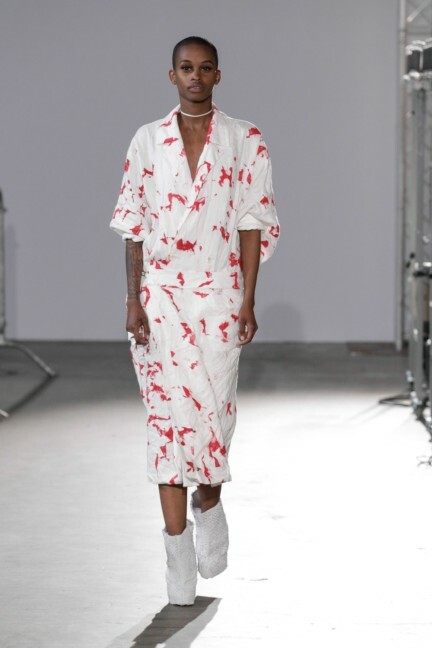 With this, S/S14BY21iNDiVDUALS adds a new chapter to the story of the brand. The concept reflects the struggle that has become a fundamental part of the identity of the current generation. 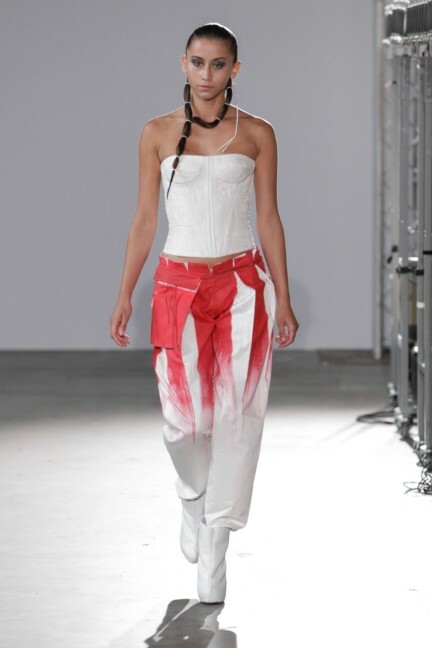 This concept is translated into a collection based on the expression of individual freedom. The diverse dyeing and painting techniques give each garment its own character. 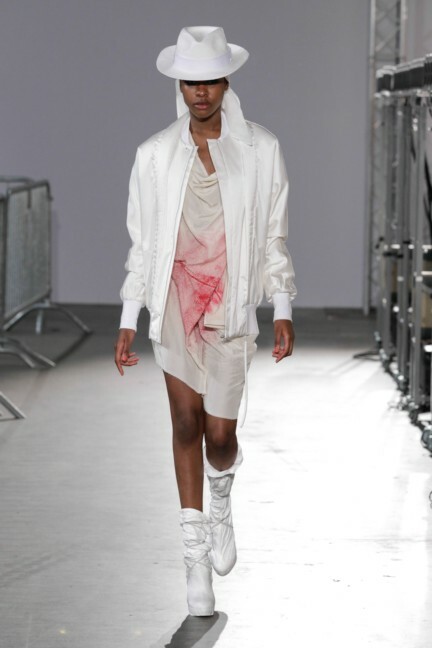 The collection is a mix of short jackets, draped dresses, and shorts which serve both men and women. What stands out next to the red/white colour palette is the use of fish leather, as well as recurring details such as hand-stitching which create consistency in the design signature. This season, iNDiViDUALS played with the familiar components of a collection presentation and created an experience through sound, space and atmosphere. The models walked around the guests, who stood in the middle of the Transformatorhuis. This setting called the traditional role of spectator and model into question. Not only were the roles reversed, but the front row disappeared as well. Each and every guest could choose his or her own place to stand. The innovative ‘wave field synthesis’ machine, which can spatialise sound via 192 speakers, strengthened the emotions of the public. The use of audio in this way marks a state-of-the-art innovation in the area of new media during Amsterdam Fashion Week. The unique system was provided by The Game of Life foundation, the soundscape composed by the International Soundlings Collective. The music and sound were made possible thanks to a collaboration with MediaLAB Amsterdam, an initiative of the Amsterdam University of Applied Sciences and the University of Amsterdam. iNDiViDUALS is a platform for fashion creativity. iNDiViDUALS is an initiative of AMFI – Amsterdam Fashion Institute and Amsterdam University of Applied Sciences. See also www.individualsatamfi.nl.